Logitech recently announced the G PRO wireless gaming mouse at a price of $149.99. The Logitech G PRO wireless mouse is the first mouse to use the High Efficiency Rated Optical (HERO) 16K sensor, which provides superior accuracy and speed. And the G PRO gaming mouse utilizes Logitech’s new LIGHTSPEED wireless technology, offering responsiveness that is necessary for professional gamers participating in tournaments. And Logitech designed the PRO wireless gaming mouse over a two-year period in collaboration with over 50 professional players. This is why it is optimal for esports professionals. Professional gamers usually prefer to not be tied to a mouse cord, but accuracy is necessary — which is hard to find in a computer mouse. Cord drag can cause friction and distraction in an esports environment. 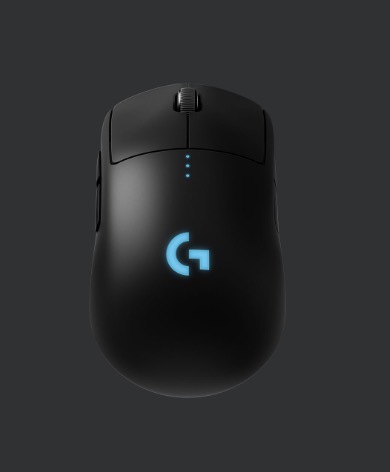 The G PRO mouse has end-to-end wireless technology that overcomes limitations around latency and connectivity. And its wireless technology provides a lag-free 1 ms report rate connection. In order to win games, you have to be fast and precise. This is where the HERO 16K sensor really shines as a feature. The HERO 16K sensor was optimized to “track insane flicks at speeds over 400 IPS without spinning out.” And it delivers peak performance for any sensitivity with zero smoothing, acceleration, or filtering between 100 to 16,000 DPI. And HERO 16K also consumers ten times less power than its predecessors, which facilitates a lighter battery and longer battery life. The left and right side buttons are removable so it makes the PRO Wireless ambidextrous. The pros can decide how many side buttons that they want to use from zero to four. However, the Logitech G HUB software will be required to reprogram DPI buttons and it will be available starting on September 3rd, 2018. The good news is that the Logitech G PRO wireless gaming mouse can be used out-of-the-box. This is possible because the preset button settings can be configured to your custom preferences using Logitech Gaming Software (LGS). With LGS and the onboard memory, the G PRO can save your preferences directly to the mouse for faster and easier use on tournament systems. And the mouse settings will remain consistent from home to stage. This way you can skip installing custom software and you can avoid settings reconfiguration. The G PRO wireless mouse has a metal spring to tension separated left and right button keyplates, the travel distance, and the actuation force (force necessary for clicking) was reduced. At $149.99, the G Pro is placed in a premium price point. You can buy other wireless mouse products for a much lower price. But Logitech pointed out that this product was specifically designed for the pros so the price seems justified. The G Pro was designed specifically to get the job done. However, it lacks bells and whistles when it comes to aesthetics. Personally, I think Logitech’s G502 mouse looks cooler.